Does this tiger-vibed acoustic earn its stripes? A good all-round sound, acoustically and amp'd, but a little less big-hearted tonally than its dreadnought sibling. Sharp, clean styling. Fishman INK 3 preamp is great. Excellent value for money. Low-end focus might not suit all tastes, tonally. 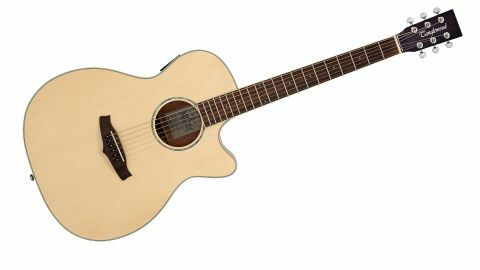 Tanglewood's quietly upped its kudos in the world of affordable acoustic and electro-acoustic guitars in recent years. Designed in the UK, with notable input from Scandinavian master luthier Michael Sanden, but made in the Far East, the company has managed to combine good value with a thoughtful, even progressive, approach to design. "There's a vibrant-looking solid Englemann spruce top - it couldn't look sharper if it wore an Ozwald Boateng suit"
This year, Tanglewood tidied up its thicket of ranges to make space for a fresh bloom of new guitars such as the Premier SEs. The SE stands for 'satin exotic' and the guitars feature lacewood, zebrano, dao wood or figured ash laminate backs and sides. The exotic wood theme continues with this brand-new, all-gloss finished Premier Deluxe model, that features laminate tiger mahogany back and side. Yup, that's a new one on us too. It's the outer facings of the three-ply back and sides that feature the figured mahogany veneer, which certainly has an unusual hue: the ripples in the grain fade through gold to brown and even to green at certain angles. Rather classy. The abalone rosette and folksy bridge seem at home on this small, but generously waisted super folk. There's a vibrant-looking solid Englemann spruce top, too - it couldn't look sharper if it wore an Ozwald Boateng suit. Under the hood, there have been other changes, with a new tapered bracing pattern that should help ensure a greater tonal uniformity on the production line. This Premier Deluxe model also introduces the Fishman INK 3 preamp, an unfussy new system that includes a Sonicore under-saddle pickup - with a neat panel of flush rotary controls within a small footprint panel on the upper shoulder. It also features a very tidy combination of strap button, jack socket and battery holder at the base, rather than the more common combined strap button and output jack with a separate battery compartment. The neck profile is very mainstream and has a very subtle V to the overall rounded, deep C profile. It's certainly a comfortable all-purpose shape and excellent for 'thumb around' left-hand styles. There's also a volute behind the nut, which adds strength at the thinnest point of the neck, and we like the way that this traditional feature has been deftly executed here. The tidily fretted rosewood 'board is slightly less cambered than any of our regular workhorse, but this sits well with the action, which is low enough to play easily but can still take some picking without untoward fret buzz. "It took very little time to feel comfortable with the variety and versatility that the EQ offers"
The tuners are perfectly fit for purpose, responding totally predictably when retuning or detuning, and overall intonation seems spot on, too, in standard and altered tunings or with a capo high up the fingerboard. When it comes to the acoustic sounds, it's rich in the low end, which becomes particularly noticeable with fingerpicking... which brings us to string spacing at the nut. It's also fine for full-blooded strumming, but feels a bit restricted for lower-position fingerstyle, especially for those of us with larger hands. String spacing at the bridge is airy, though, so your right hand shouldn't struggle. The Fishman preamp features volume, bass, middle and treble controls, and a chromatic tuner. The system comes with an instruction booklet that, for once in our lives, we looked at. It offers some simple suggestions for strummers and fingerstyle pickers in terms of EQ settings, and if you're new to the world of amplified acoustics it's well worth experimenting. It took very little time to feel comfortable with the variety and versatility that the EQ offers, and it shouldn't prove a challenge for the novice or even the most technophobic player. And there's no straining to hear the subtle nuances either: turn up the bass, for example, and you know that's exactly what you've got. There is certainly more than adequate scope for getting the sound you want plugged in - and the richer low end is still apparent when plugged in. In this household of unpredictable open tunings the inclusion of a chromatic tuner is, of course, really useful. Placed right under your nose, it's a simple press-and-hold to turn on or off. It responds quickly, but it's worth taking a little time to ensure you get the best accuracy. Initially, we found it a little lacking compared to readings from our Boss TU-2 tuner, but with a bit of care, and getting a feel for it, it's certainly fit for purpose. Like the guitar. In a crowded section of the instrument market, this guitar stands out, not least with the optional hard case that is reassuringly sturdy and rather natty, too: cream-coloured with dark brown binding and handle and emerald green lining. The instrument is really nicely constructed, and real care has been taken to give it sharp, clean styling. It's excellent value for money, too - let's not forget that this instrument comes fully gig-ready down to the last strap button.